October 4th was the 17 year anniversary of my car accident. In two more years, I’ll have lived exactly half my life “normal” and half as a disabled person; a fact that feels meaningful to my pattern-loving brain. Perhaps it it, perhaps it isn’t. I don’t actually celebrate my new life anniversary. There are times I intend to: it’s a good excuse to eat cake (as if I needed one! ), but the 4th of October usually passes by and it’s only a few days later that I go; Hey! Another year of life! This year, I spent the 4th at Arches National Park in Utah. I didn’t wake up that morning planning to celebrate an anniversary. I’m not even sure I remembered what day it was. But, since I had my Hey! moment ON the 4th, I’m going to tell all of you about it. My family and I planned to spend a week touring as many state and national parks as possible. My focus was to get as much hiking in as my body could withstand. I used to be quite the hiker: 9 miles round trip with a night spent sleeping on the ground was nothing to my younger self. Now, half that distance seems insurmountable. I physically can’t do it and my brain injury comes with some oxygen processing/breathing problems. Still, I do what I can and I’m lucky to have family that is willing to wait for me as I start up a trail. Bless my mother: I know she has visions of my passing out and my carcass sliding into a ravine but she never says a word beyond “be careful” and so, I start off. 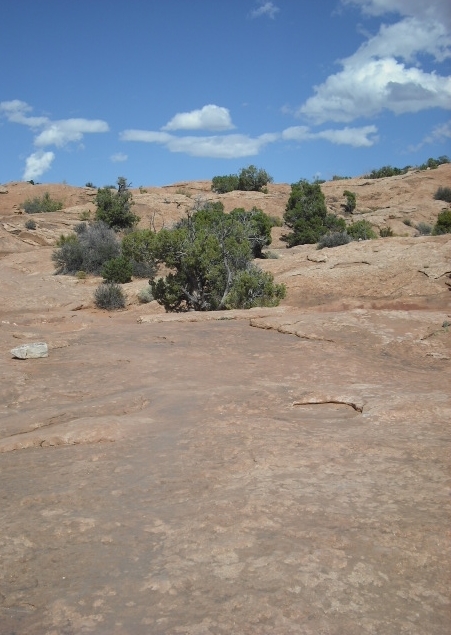 There are several trails at Arches and I could have spent a week in that park alone, still not seeing all of it. I hiked around the North and South Turrets and considered hiking the Primitive Trail but, as I hadn’t established that plan with my family, I had visions of emerging miles down the road with no way of telling them where I was. 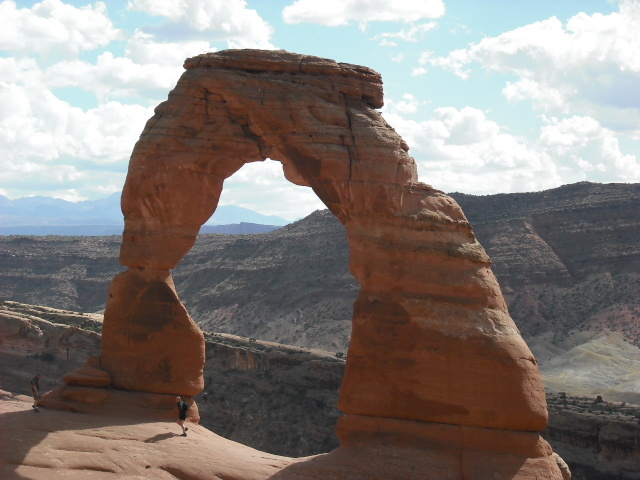 I passed on that trail and, instead, hiked to Delicate Arch. I’d misread the distance and thought the distance was a mile round trip. How bad could it be? The answer? Bad. 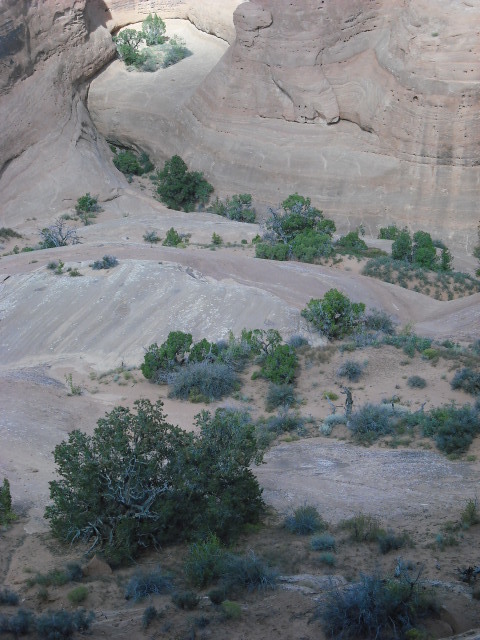 Delicate Arch is a difficult hike up a rock face with no trail to speak of. The way to the arch is marked out by little cairns and, believe me, those little pile of stones became my best friends. And, the round trip distance is 3 miles. Note to self: make sure to thoroughly read the description before setting foot on a trail. At least I had plenty of water. The first time I considered turning back was when the clearly outlined trail disappeared and I stood staring up at people scaling a rock face. “Don’t do it”, a voice warned. I was reminded of something I read in one of David Conrad’s blog posts: he says he believes the word hike should only relate to something that can kill you. I don’t disagree with that statement and my hikes these days are really more walks. I had an inkling this qualified as a hike. I turned and stared down at the parking lot. My family wouldn’t care if I turned back. 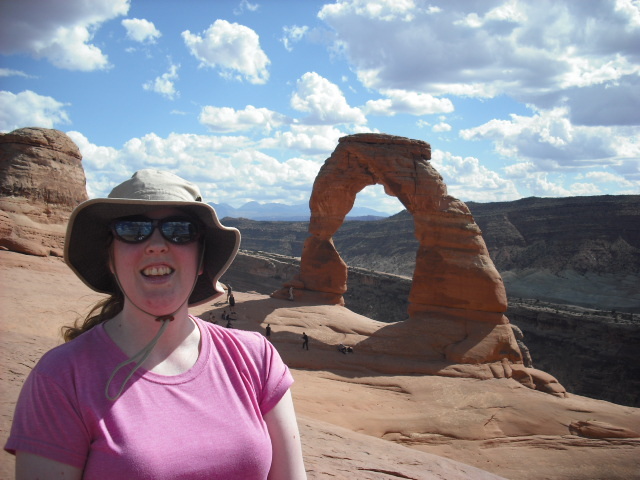 Sure, they wanted a picture of Delicate Arch but no one had any expectation of me pushing my body beyond its limits. Really, the only one with that expectation was me. I knew that if I gave up, I would regret it. I would feel like I failed. I wanted to see Delicate Arch. I wasn’t giving up. I’d take my time, stop and breathe when I needed to, take some sips of water. I didn’t need to compete with anyone. I didn’t have to feel embarrassed at needing to stop and breathe. I started up. I don’t have words to express how difficult this hike was. I feel a little ridiculous: there were people who breezed passed me like it was nothing. But then, I passed people who were also dragging themselves up to the arch, red-faced and wheezing. Solidarity, my hiking peeps. I did stop, frequently, and there were many times when I considered turning back. Those considerations flooded my mind more and more as the pain in my back, neck, and shoulder set in and it became more and more difficult to stand upright. Still, I persevered. Like an idiot, I’m sure. 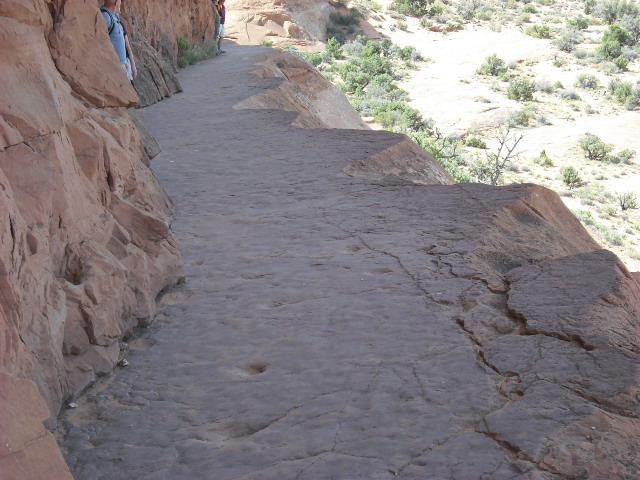 The hike to the arch ends with a series of stone steps and then a ledge that wraps around a cliff wall. I recommend hugging the wall as much as possible. On the day of my hike, the wind was rather strong and the drop off from the ledge is significant. But, it’s worth it. I rounded the cliff wall and the rocks dropped from my sight. There was Delicate Arch. It stands alone in this vista of rocks and sky and was worth every ounce of energy it took to see it. There were several intrepid souls who hiked down to the arch and took pictures with, under, and through it but I could not. I still had to hike down so I found a seat, caught my breath, drank more water, and enjoyed the view. I tried to take a selfie with the arch but my selfie skills are non-existent. My thanks to the stranger who offered to take my photo. Down was, of course, easier but I admit I dragged myself into the parking lot. I laughed and told my family I was probably done with hiking for a day or two but I really wanted to burst into tears and stick my body in a hot bath. I had a picture of the arch and, in my seat in the van, I asked myself if all the pain and exhaustion I felt was, indeed, worth it. It was then I had my Hey! moment. 17 years. I must, after all this time, accept I’ve made all the progress I’m going to make. I’m not going to get any better. I’ll never hike another 9 miles with two days of supplies, a tent, and a sleeping bag strapped to my back. I’ll never work a full time job. That person did-for lack of a better word-die in that car. Now, I must learn to live as this person. I must accept that every day is going to be a fight to push the boundaries of my limitations as far as I can. It’s going to be hard. I’m going to want to give up. But, if I press on, there will be moments of breath-taking beauty waiting for me at the end of difficult trails.